In 2-quart saucepan, combine all pilaf ingredients. Bring to a boil. Reduce heat; cover and simmer 20 to 25 minutes or until bulgur is tender and liquid is absorbed. Remove from heat; fluff with fork. Cover to keep warm. Meanwhile, heat grill. Bring 1 cup water to a boil in large skillet. Reduce heat to medium. Add carrots; cover and cook 3 to 5 minutes or until crisp-tender. Drain; blot dry with paper towels. In small bowl, combine oil, 1/2 teaspoon salt, 1/4 teaspoon cumin and 1/4 teaspoon pepper; mix well. Brush mixture on zucchini, summer squash, bell pepper, onion and tomatoes. When ready to grill, place vegetables in grill basket or directly on gas grill over medium-high heat or on charcoal grill 4 to 6 inches from medium-high coals. Cook 8 to 10 minutes, turning occasionally and removing vegetables from grill when tender and slightly browned. Cut vegetables into bite-sized pieces. Place pilaf in center of large platter. 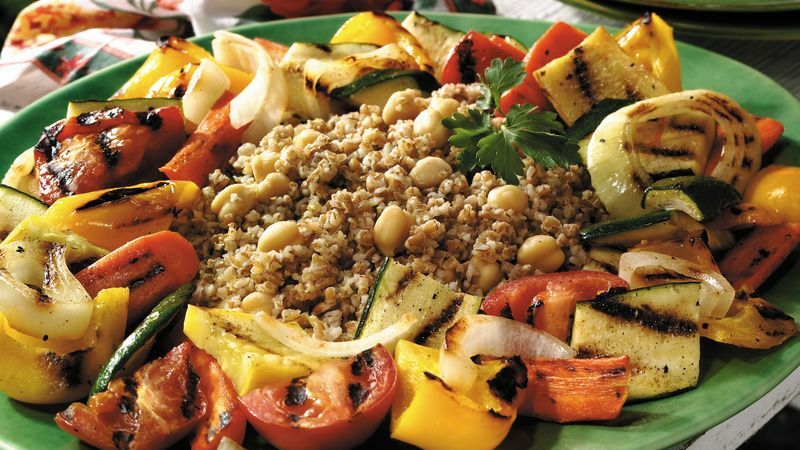 Arrange grilled vegetables around pilaf.